This is lovely; a truly beautiful meditation on life and loss and survival. Mary, I love the way you put words and thoughts together. This is a lovely piece. Please keep us updated on your Robins! Thanks, Lee. I will. I’m so excited about the babies. I check on them, cautiously, every day. Mary, I loved this post, your napkin poem. Keep those robins safe! This is so perfect. The tiny fragile babies, then again doubled in size. And then napkin poetry! I sort of had one of these magical nights with siblings. It was long ago and I didn’t realize that might be it. Maybe there will be more, but far better just to appreciate and record for posterity. So great you saved those napkins. When I was a postman, a lot of my poems/lines were scribbled down on the back of Royal Mail ‘while you were out…’ cards. Late in replying, I know, but . . . did you save the cards? I love your poetry, by the way. Beneath the tough exterior we sometimes portray, I think we all are vulnerable. I think we are all a little fragile. We all have a breaking point – a point when we boil or freeze, bend or break. Some bend more than others. We are all human – it’s the human element. 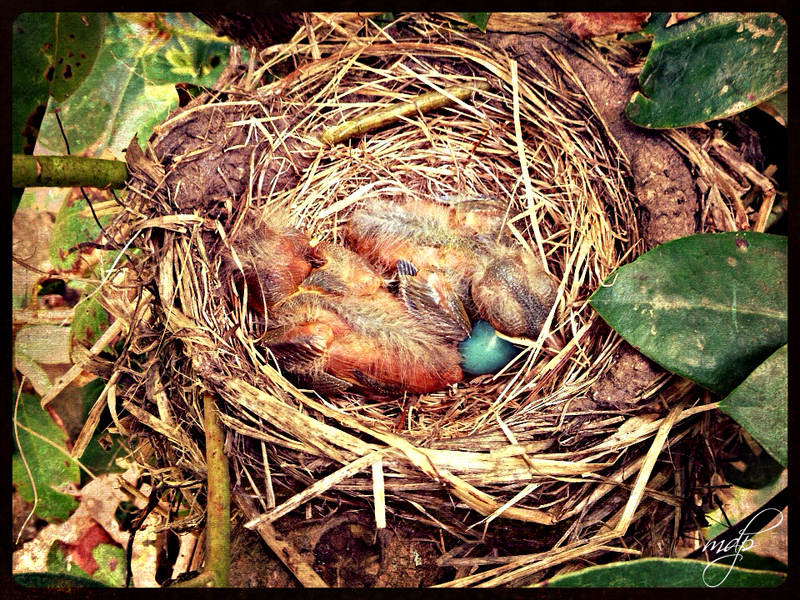 I love the robins… We have a few nests around the yard. Fortunately, Ivy is low to the ground or she’d be in ’em…my kids, too. The poem is a nice thing to hold on to. Never let it go, just like the memory of that night. So sweet and beautiful. Wee babies. 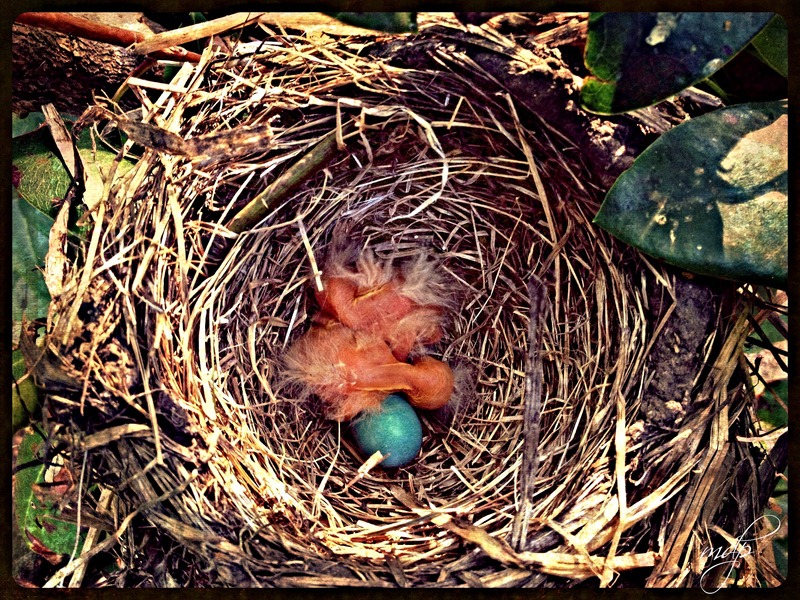 Wine, poetry on napkins and baby birds….sigh. Your words always capture me right from the start. My “napkins” have always been scraps of paper. After my daughter left for college, I cleaned out her room and found priceless pieces of paper scattered everywhere. Thoughts, notes, errands and middle school poetry. I have them safe in leather box that I keep all of my treasures. Another lovely recollection, Miss Mary. Poems on napkins (big sigh). Surely yours is a most wondrously creative–and loving–family, dear friend. I reread your poem/story, so very tender, loving, sweet. I wonder if I can print it. I’d frame it and put the photo on my bed side table. Lovely post and photos, Mary. What a gorgeous post. Those napkin poems tell such a story. Three poetry-writing siblings and now here you are, binding the memory to this summer story of new life and hope. Well done! Mary, I just want to again tell you how much I enjoy your writings. Whether describing your sibling relationships, or some of the unique experiences growing up in Star Lake, or the common memories that we both share, you strike a chord. I find that those chords resonate with me for days and weeks afterward. Thank you for sharing your thoughts and memories with the rest of us!